Paul Reubens or better known as Pee-Wee Herman had some exciting news today. Though it’s only a tease, a big announcement is coming sooner than later. Reubens, who can be heard in ‘Smurfs 2‘ talked a little bit about that film and his upcoming Pee-Wee projects. We’ve talked about potential Pee-Wee projects before on the site, but this time it seems like they are finally happening and in the near future. First, Reubens played Jokey Smurf in ‘Smurfs 2‘ where if you weren’t paying complete attention, you would have missed his line or two of dialogue out of the whole film. He went on to say that he hopes for a bigger role in the third film, if the studio plans on making a third one. I would think they will, since the 2nd film is doing so well. But Reubens is not too worried if a third Smurfs film will rise, because a director has been chosen for the new ‘Pee-Wee‘ film. However, Reubens did not reveal who this director would be. We do know that Judd Apatow is producing though and that the script and financing is all set and ready to go. Reubens also said that film will likely start shooting early next year and will continue the 80’s comedy tradition from the first film, according to the LA Times. This is HUGE news for Reubens as he is now in his 60s, but seems to not have lost a beat. He recently rose to super stardom again with his Broadway hit play of his former TV show. As far as a director is concerned, I cannot wait to see who has been chosen. I’d like to think that Tim Burton would return to direct as he directed the fantastic ‘Pee-Wee’s Big Adventure‘, which was Burton’s first feature film. But maybe someone like Frank Oz, Joe Dante, Barry Levinson can do it right. We will update you as soon as we hear word. 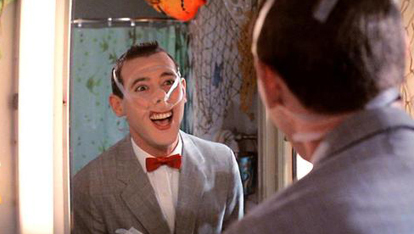 Pee-Wee Herman Is Coming Back To Big Screens in 2015!!! This entry was posted on Wednesday, August 7th, 2013 at 12:38 am	and is filed under Film, News. You can follow any responses to this entry through the RSS 2.0 feed. You can skip to the end and leave a response. Pinging is currently not allowed. « Josh Gad To Play Sam Kinison!! !